Now you can watch dozens of channels on your computer, laptop, iPad, tablet, iPhone or Android phone. WatchTVEverywhere has created an instructional video to walk you through the simple, step-by-step process of registering and setting up your account. Find a recent copy of your Ashland Home Net statement. (You'll need your account number & last name on the bill). Click on "Register". Fill out the form and remember to save your username (email) and password in a secure location. (You may have up to four users. The first must be considered the primary account holder and be at least 18 years of age). When you submit the form, you will be emailed a registration link. When you receive the email from watchtveverywhere.com, open the email and follow the instructions by clicking on the registration link provided. This will return you to the site and you will now be registered. You only need to do this one time. Using any web enabled device (PC, tablet or smart phone, login to watchtveverywhere.com using the Username (email) and password, you've created and select the PAC 12 Network from the menu. It's that simple. 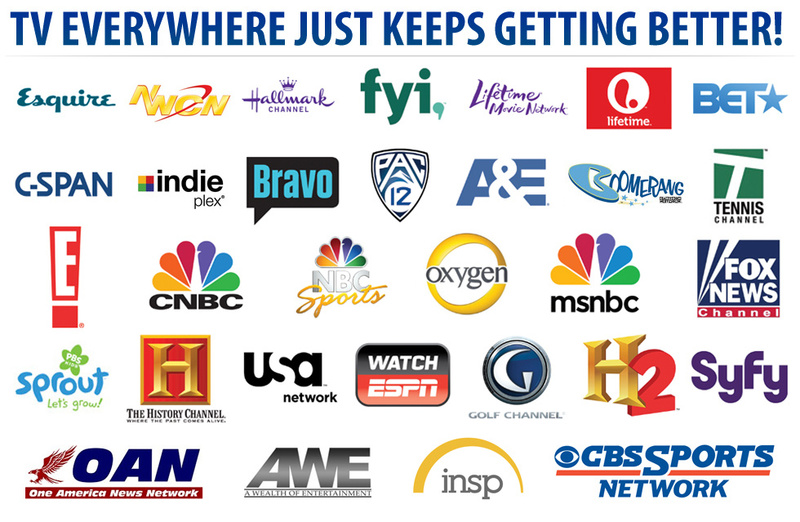 WatchTVEverywhere is a trusted third party provider that the networks have partnered with to bring cable tv channels to you on all your smart devices. The PAC 12 Network was the first and now A&E, BET, Bravo, C-Span, CMT, CNBC, Comedy, E!, WatchESPN, Esquire, FXB, FNC, FYI, Golf, History2, Hallmark, History, Lifetime, LMN, MSNBC, MTV, NBC Sports, Nick, Oxygen, Pac12, Spike, SyFy, USA and VH1 are all available. Click here to watch a 5 minute video about using WatchTVEverywhere. Includes live TV. For example, WatchTVEverywhere included more than 2,000 hours of Olympics coverage. Hulu and Netflix only provided previously recorded shows. A TV network doesn't necessarily own all of the rights to all of the programs they transmit. A TV network may have the right to transmit a movie, but only to TV sets, not on WatchTVEverywhere. So, once again, it depends on the TV network. Once you are registered, you can watch any WatchTVEverywhere program as long as you are a subscriber to that network. For example, you must be an A&E subscriber to watch A&E's WatchTVEverywhere programs.